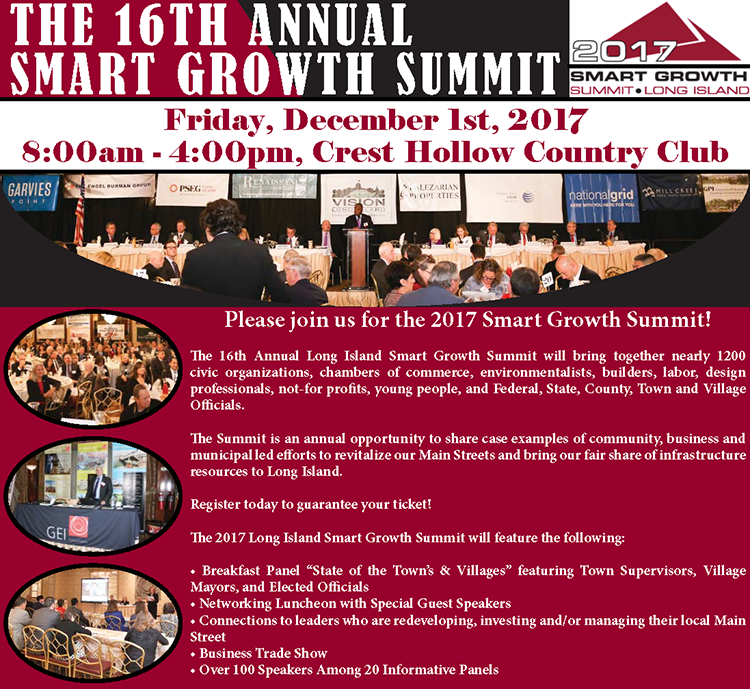 Register Today for the 16th Annual Smart Growth Summit! NYS Comptroller Thomas DiNapoli has released a report stating that the Metropolitan Transportation Authority (MTA) will need to find new sources of funding or raise fares and tolls. DiNapoli noted in his report that Long Island Rail Road and NYS subway system have seen a drop in performance. Trains are operating late on a more consistent basis with delays reaching a 17 year high, a result of an increase in delays rlated to Amtrak owned tracks, signals, and switches as well as the LIRR itself. Subway trains are also breaking down at an increasing rate while the fleet of cars continues to age and ridership rises sharply. "Maintaining, modernizing and expanding the largest mass transit agency in the nation is critically important to the future of the New York metropolitan region," DiNapoli said. "In the absence of adequate funding, the system could fall into further disrepair and riders could face unplanned fare hikes. The state and city need to find solutions to prevent these possibilities from becoming reality, and the MTA must make the best use of its resources." The MTA has invested over $120 billion in improvements since 1982, but the pace has not kept up with need during that time frame. The Authority has also recently begun implementing a Subway Action Plan aimed at fixing some of the ongoing issues with a price tag of almost $9 billion for the two phases to be completed in the mid-2020’s. It is still unclear where some of the funding for those projects will come from and the recurring costs associated with the plan have not been addressed as of yet. If financial assistance cannot be provided through federal and state funding the MTA may be forced to raise fares and tolls in order to fund the projects and ongoing operating costs. Budget gaps are already projected starting in 2019 and growing through 2021. The state will continue to identify possible revenue sources in order to avoid hikes that are not already planned. You can read more on this here and the full report here. Beginning this week the LIRR will provide a significant boost to train service on the North Fork with new timetables and a new westbound morning train. The new train will provide for a 12:33 arrival in NYC and will make all local stops to Ronkonoma after leaving Greenport at 9:43 a.m. The new train service was born out of a desire by the local community members and elected officials who worked with LIRR to enhance East End service. The group included Assemblyman Fred W. Thiele Jr., County Executive Steve Bellone, NYS Senator Ken LaValle, Assemblyman Anthony H. Palumbo, and others. The group met with LIRR officials to discuss the improvements before they were implemented. Another new service is a westbound train that will depart from Yaphank at 6:00 p.m. and will serve Medford and Ronkonkoma while offering the possibility of a future connection at Ronkonoma once the Double Track and Line Expansion projects are completed. These changes will be accompanied by a slight reshuffle of existing timetables for existing trains. You can read more on the North Fork changes as well as general current updates from the MTA here. Vision Long Island Board Members and staff were out at the LI Business News Hall of Fame gala to celebrate the induction of Director Eric Alexander and others. The event is held annually in order to honor distinguished leaders from the local business community. Honorees have demonstrated a commitment to excellence and a drive to improve the future of Long Island. All inductees are selected by a committee of top business leaders on Long Island. Honorees this year included Michael Dowling, Northwell Health, Wayne Grosse, Bethpage Federal Credit Union, Esther Fortunoff Greene, Fortunoff Fine Jewlery, Dr. Calvin Butts, SUNY Old Westbury, Marc Beige, Rubie's Costume, Joy Fernandez, Ernst & Young, Stanley Bergman, Henry Schein, Frederick Johs, Lewis Johs Avallone, Steven Scleshinger, Jaspin Scleshinger, Anthony Scotto, Scotto Brothers, Lew Meltzer, Meltzer Lippe, and Eric Alexander, Vision Long Island. Vision Long Island congratulates all the honorees this year and wish them luck on their journey to improve the region. Vision Board Members present at the event included Lionel Chitty, Judy Simoncic, Keith Archer, Neal Lewis, Don Monti, Jorge Martinez, Maribeth Pietropaoli, Michael Puntillo, supporters Elizabeth Custodio, and staff Tawaun Dezaray Weber, Elissa Kyle and Jon Siebert. Vision Board and staff were out this week along with representatives from the Nassau & Suffolk Chambers, Long Island Business Council and the Long Island Association to hear from New York State about the new Paid Family Leave policies for small businesses. New York State Labor Commissioner Roberta Reardon's presentation covered eligibility, benefits and processing of the law, saying that New York’s program will be the best in the country. Currently, California, New Jersey, Rhode Island and Washington D.C. have Paid Family Leave. Beginning January 1st, New York’s Paid Family Leave program provides wage replacement to employees to help them bond with a child, care for a close relative with a serious health condition, or help relieve family pressures when someone is called to active military service. Employees are also guaranteed to be able to return to their job and continue their health insurance while receiving benefits. If an employee contributes to the cost of their health insurance, they must continue to pay their portion of the premium cost while on Paid Family Leave. Employees may take the maximum benefit length in any given 52-week period. The maximum benefit is eight weeks during the first year, 10 weeks during the second and third years, and 12 weeks the fourth and subsequent years. The 52-week clock starts on the first day the employee takes Paid Family Leave. Paid Family Leave coverage will be included under the disability policy all employers must carry. The premium will be fully funded by employees through payroll deductions, with some of the deductions already beginning. What was noteworthy was the modest cost of the program with the maximum of $85 annually, or roughly $1.50 a week contrasting with the important benefit. The maximum employee contribution in 2018 is 0.126% of an employee’s weekly wage capped at 0.126% of the annualized New York State Average Weekly Wage, which is currently $1305 per week. Most private employers with one or more employees are required to obtain Paid Family Leave insurance, which will be obtainable through their disability insurance carrier. Employees with a regular work schedule of 20 or more hours per week are eligible after 26 weeks of employment. Employees with a regular work schedule of less than 20 hours per week are eligible after 175 days worked. In limited circumstances, employees whose regular work schedules are temporary or seasonal may opt out of Paid Family Leave. Citizenship and immigration status do not impact a worker's eligibility for Paid Family Leave. The Brentwood School District has teamed up with the 4 Towns Civic Association to file a lawsuit seeking to halt the Heartland Town Square project in Islip. The suit was filed in State Supreme Court against the Islip Town Board and Heartland developers. The plaintiffs are seeking to overturn the approval of the first phase of the project based on the allegation that the environmental impact studies underestimated the burden the project will have on local schools. Wolkoff went on to note that in the past 16 years he has paid out approximately $11 million in property taxes without adding a single student to the system and openly wandered what the district has done with the money. The first phase was approved back in July by the Town Board. Supervisor Angie Carpenter noted at the time that this proposal has gone through more scrutiny than any other project in town history. The project is currently slated to be built in stage with 1,000 to 1,200 apartments, 250,000 square feet of retail, and 200,000 square feet of office space in the first stage. The first portion of phase one will cost about $500 million and take up to two and a half years to complete, with an overall estimate of 10 years for the entirety of the first phase. The Village of Freeport has finished and officially opened a new Emergency Management Center in order to be better prepared for the next big storm to hit Long Island. Located at 8 North Long Beach Ave, outside the 100-year flood zone, the center was planned and built in response to Superstorm Sandy. The center will house the Village’s emergency vehicles and tools, which were previously housed near Freeport Bay at the Department of Public Works, which was destroyed during Sandy. The new center will provide a safe space for emergency workers to respond to disasters without possibly losing their own equipment. In addition to the new management center, Freeport has been working to improve storm resiliency in other ways. The village recently installed backflow valves along with dewatering pumps aimed at preventing street flooding in southern neighborhoods. It is hoped that this move will help to prevent flooding during the next big storm. Mayor Robert Kennedy has also been an advocate for surge-barrioer gates at Jones Inlet and East Rockaway Inlet. During major storms the gates can be closed to prevent storm surge from impacting the shore severely and protect against flooding. The Village Board of Valley Stream has scheduled a public hearing on November 27th to review a proposal for a 28-unit apartment complex just off of W Merrick Road in the local downtown. The Board of Trustees previously voted to change the zoning at the location back in April in order to allow for commercial parking. Now the board is looking for a second possible change in order to allow parcels with multiple-family townhouses, condominiums, cooperatives and apartments. Should the zoning change go through it will most likely lead to approval for the apartment complex, currently being called Parkside. Mayor Fare would go on to note that while the Village Board is unapologetically pro-development, it was not trying to overdevelop and build hundreds of units at once the way that Mineola had. He also held up the Promenade, another apartment project currently in development, as a project that is showing steady progress. This is in conjunction with appraisal of Parking Fields in the heart of downtown for prospective buyers and an RFP for a section of land just south of Sun Valley Towers. This is all being done in response to an increased interest in building in the downtown. As a part of tax reform, Congress is considering eliminating the transportation fringe benefit. This is a benefit that provides commuters with the option of tax-free employer provided parking and transit. Eliminating this benefit would impact almost all commuting Americans and would create an accounting nightmare for businesses of all sizes. Additionally, eliminating this benefit would impact transit ridership and as a result would create more congestion on our nation’s transportation system. We are joining forces with the Commuter Benefits Works for Us coalition and are asking you to act today by helping spread the word and contacting your Member of Congress. Click here to make your voice heard to your Members of Congress. On November 17th through 19th LaunchPad Huntington will be helping out local entrepreneurs to take their business from concept to creation with their Startup Weekend Long Island event. The event will cover basics for individuals looking to start up their own business and offers the chance to tap new resources, meet seasoned entrepreneurs, and network with people who work in and out of the tech field. The weekend is part of a global event though LaunchPad Huntington is the only local site participating. The event will start with dinner and networking before moving on to a weekend project built with a team, a 60-second pitch to an expert panel, and more. The weekend-long event will be geared around professionals looking to develop skills for a career change. You can get more information as well as a list of event judges, mentors, and coaches here. The open application period began on August 14 for two competitive Hazard Mitigation Assistance grant programs. Eligible applicants including territories, federally recognized tribes, states and local governments may apply for the Fiscal Year (FY) 2017 Flood Mitigation Assistance (FMA) and Pre-Disaster Mitigation (PDM) grants through 3 p.m. Eastern Daylight Time on November 14, 2017. FMA grants are available to implement measures to reduce or eliminate risk of flood damage to structures insured by the National Flood Insurance Program (NFIP). For FY 2017, $160 million is available, including $70 million for community flood mitigation activities that address flooding on a neighborhood level, such as floodwater diversion and localized flood-control measures as well as advance assistance for mitigation design and development of community flood mitigation projects. The remainder of funds will be used for mitigation planning, technical assistance and mitigating Severe Repetitive Loss and Repetitive Loss structures, which include elevation, acquisition, and relocation projects. PDM grants are awarded for all-hazard mitigation planning and projects, such as the construction of community and residential safe rooms for tornados, and wind retrofits, which are enhancements made to strengthen the roof, walls and doors of structures to minimize damage caused by high winds. This year, $90 million is available, including $10 million for federally-recognized tribes. States, tribes, territories and the District of Columbia may apply for the statutory allocation of up to $575,000 federal share. The remainder of funds will be awarded on a competitive basis with an emphasis on mitigation activities that complement the post-disaster funding available under the Hazard Mitigation Grant Program and the flood mitigation funding from the FMA program. You can learn more and apply for funding here. The New York State DEC continuously accepts applications for Technical Assistance Grants (TAGs). TAGs are a citizen participation tool available to eligible community groups to increase public awareness and understanding of remedial activities taking place in their community. TAGs are available to eligible community groups for the purpose of obtaining independent technical assistance in interpreting existing environmental information about an eligible “significant threat” site being remediated in the State Superfund Program or Brownfield Cleanup Program. Technical assistance is intended to help the grant recipient and the community it represents to understand existing environmental data developed about the site, comment on site remedial activities and proposals and share this information with the public. Funding is limited to $50,000 per site, with no matching requirement. A community group must be a nonresponsible party community group or one that is in partnership with another nonresponsible party community group. The group must be a 501(c)(3), and a group whose members’ health, economic well-being or enjoyment of the environment may be affected by a release or threatened release of contamination at the eligible site. The group must be one whose membership represents the interest of the community affected by the eligible site. Eligible sites must be Class 2 sites on the New York State Registry of Inactive Hazardous Waste Disposal Sites or sites being remediated under the State’s Brownfield Cleanup Program that the DEC has determined pose a significant threat to public health and/or the environment. For more information, you can visit the DEC’s site here. The Long Island Coalition for the Homeless is seeking applicants for a Full-Time Case Manager for our main office in Amityville. This position requires an ability to understand policies and regulations; work with homeless individuals and families, conduct assessments, and gather documentation for housing referrals; research resources for homeless and at-risk households. Qualifications include: Minimum of a Bachelor’s Degree in a Social Work and two years’ experience (internships or volunteer work acceptable); or a related human services field or a minimum of three years’ related experience in human services arena; ability to comprehend and interpret government regulations; strong organizational skills; possesses effective verbal and written communication skills; working knowledge of computer database applications (Foothold AWARDS - preferred, Access, Client or Customer databases of accounting database software) or ability to learn quickly. Applicant must have a commitment to organization’s mission and goals. Must be self-motivated; must be able to work effectively with diverse people and personalities and as a member of a team. Bilingual (Spanish and English) preferred. Local travel will be also required for this position. Benefits after probationary period will be available. These include paid time off (vacation, holiday, sick, personal), medical insurance for the employee (premium paid by LICH), and Simple IRA plan (with employer match). Salary range for this position is $35,000 - $40,000. Next Saturday American Express encourages you to get out into your local downtowns and Shop Small in order to do your holiday shopping. Sine 2010,American Express has partneres with local Mom & Pop stores in order to promote the idea of shopping in your local neighborhood the Saturday after Thanksgiving. This year, Vision Long Island encourages you to join in and help grow our local downtowns with your business! You can read more on Smart Growth Saturday and look up participating businesses here.